Set of 2 bride and groom toppers for your wedding cake! These bird toppers are handmade, dressed in vintage pattern paper, a handmade felt top hat & ribbon bow tie for the Mister, and lace & net veil, with a strand of pearls for the Missus. The Bride bird also has a pair of killer lashes and lipstick to finish the look. We custom make set of 2 love birds upon request. All orders are handmade and can take up to 2-3 weeks before they ship. If you would include your wedding date, and when you need the birds by, in the message to seller section when you purchase, we'd appreciate it. We do our best to get them to you as quickly as possible, and will try to accommodate rush orders to the best of our ability. Please note that each set of birds does has individual characteristics, meaning each ordered set might look slightly different from sample photos. We make them to match as best we can. We'd love to see our Love Birds at your wedding. 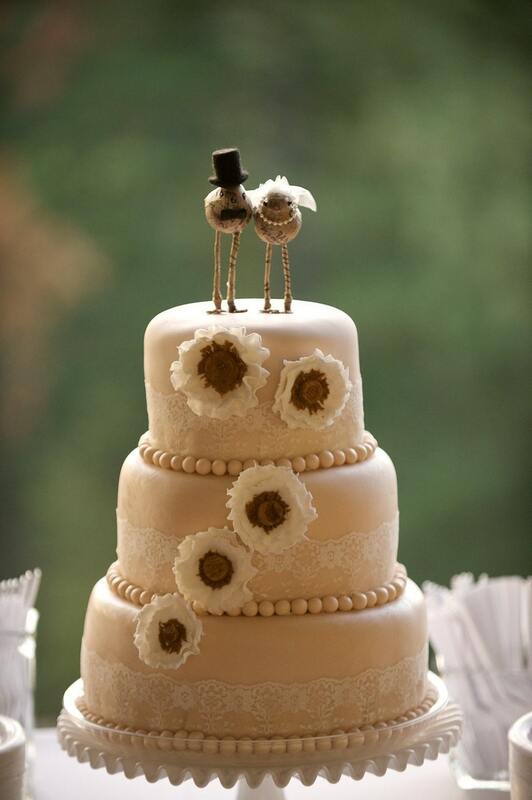 If you'd be so kind as so send us a photo of our birds on your cake, at your wedding, we'd be much obliged.